from studying. Okay, I read for about 30 minutes till I saw Beate’s tutorial on making a milk carton box. I have always wanted to make one of these. I thought, how cute of a gift for a new baby or as a shower gift. I used Kraft CS for this project just to keep it simple and quick. I used Nursery Letters Jumbo Wheel in Versamark ink to the bottom of the box (before assembling), applied Crystal Clear Embossing Powder, and heated to set. Added kraft stars to top of box created with Star Punch, and adhered using Mini Glue Dots. Used Fiskars scalloping scissors to top of carton just to add a little something up there cause, like I mentioned, it is plain with all the details at the bottom of the carton. The sentiment medallion — started with Shimmery White CS and Scallop Punch. Next is Textured River Rock CS and 1-3/8″ Circle Punch. Then, Bashful Blue CS and 1-1/4″ Circle Punch. Adhere these together and attached a Pewter Jumbo Eyelet to top using Crop-A-Dile Tool. Added a yellow striped ribbon tab to back of this medallion…ribbon from Sherbert Ribbon Originals. 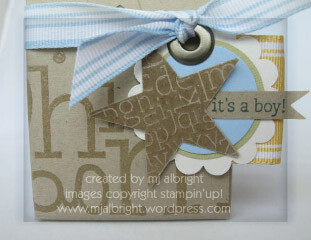 The star & sentiment is from Nursery Necessities Stamp Set. 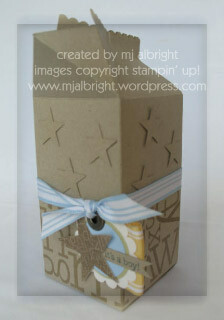 Stamped the star in Versamark ink on Kraft CS and used Large Star Punch to cut out. Stamped sentiment in Blue Bayou ink on Kraft CS. Attached this medallion to box using Bashful Blue Striped Grosgrain Ribbon. It didn’t take long to make this. Tried to keep it simple and let the details of the sentiment be the main focal point. You are amazing! I love this carton. The stars on the top of the box, the scallops and your wonderful sentiment! Everything is fantastic! Ooh, I absolutely LOVE the tag! I have 3 boys and NO girls, so I’ve been looking for a way to ‘toughen up’ the scallop punch–this works great! Love this Mary Jo! I really have to make one of these! Awesome! This is very cute, its perfect for baby boy gift! This is so cute. I will have to try one of these! Thank goodness you have your priorities straight, Mary Jo — who needs another lifesaver; there is only ONE Mary Jo Albright, Stamping Goddess!!! Your stamping public NEEDS you to stamp and inspire us DAILY!!! : ) Awesome carton, of course! Beautiful milk carton. I love the Kraft carton and then the beautiful medallion art piece. Excellent job!